Taken from the preface of The Fall of Anne Boleyn: A Countdown by Claire Ridgway. Who were her ladies who attended Anne on the scaffold? We do not know who attended Anne on the scaffold, although legend has it that Margaret Wyatt, Lady Lee, attended her. The ladies are unnamed but I think it is likely that they were some of those who attended her during her imprisonment in the Tower – Mary Orchard, Mrs Stonor, Lady Elizabeth Boleyn (Anne’s aunt), Lady Anne Shelton (another aunt), Margaret Coffin and Lady Mary Kingston. No, he attended her execution. Fitzroy died on the 23rd July 1536, two months after Anne’s execution. In The Tudors series, they had him dying as a child but that was one of the inaccuracies of the show. In fact, on the very afternoon that Anne Boleyn was arrested and taken to the Tower of London, Fitzroy visited his father, the King, and Henry VIII told him “that both he and his sister, meaning the Princess, ought to thank God for having escaped from the hands of that woman[Anne Boleyn], who had planned their death by poison, from which I conclude that the King knew something of her wicked intentions.” (Chapuys) Fitzroy’s death in the July was a real blow to the King as he was his only living son at that time. This always moves me to tears, I just keep feeling how she would have felt. Henry VIII was a dreadful, dreadful man. Yes, he was good in so many ways but his treatment of Anne, and also Catherine of Aragon and Mary, was appalling. What an amazing woman. And such a woman of courage and dignity. She would be The Person in history. I would love to sit and talk to.May God Bless. May she rest in peace. Her courage at the scaffold gets me thru my dark moments. If she could face death with such composure, then, by God I can face a little physical pain. My challenges are nothing compared to what she endured. She deserves to be remembered thorough the ages. We will not forget you, the world knows you are innocent as well as all who died with and for you. Rest in peace my Anne. Anne, we know you were innocent, may you rest in peace. My Prayers are with you, you were an inspiration to all. God bless you. A beautiful reading Claire….I could picture the tragic scene in my mind as I listened. Very moving, thank you. I actually got choked up reading it! I always do because I keep thinking that they were spoken by a woman about to die and that hits me every time. Who wrote down her final words? Or had she prepared them in advance? I always wonder what would have happened if she had been spared and Elizabeth would have had the chance to really know her mother. Elizabeth often reference her father in the things she did. What if she could have reference her mother? What a powerful legacy that would have been. I’m always amazed that Anne could say such nice things about Henry in her speech. I know it wouldn’t be ‘proper’ scaffold etiquette to say anything insulting, but she could have just not said much at all, rather than what she did say. It certainly showed who the bigger person was. Bless you Anne. There are so many of us thinking of you, especially today. Wow, Claire, your voice is so pleasant to listen to. It truly put me there as if I were watching it happen before me! I have to admit that I cried too. Thank you for sharing this with us. Thank you! I tried to read Anne’s words with meaning and it was an emotional experience actually reading them out loud. What an amazing description Claire and I agree with Bridgett, you’ve definitely got a voice that is so easy to listen to. Listening to you describing it all brings it so much more alive and real…I found myself conjuring the scene in my mind. I am really glad you did this and shared it with us all Claire, thanks. I am thinking of doing audio versions of the books as a few people have asked. Thank you! Today is a day to remember and pay respect to a woman, a mother, a Queen, whose execution was a brutal act of cruelty. But I also think it is a day to celebrate her life. I don’t think Anne would want us to spend the day in sadness, she would want us to remember her when in full bloom, full of life and vitality. Her happy childhood at Hever, her learning days in Europe, and her growing and exciting days at the court of Henry, when she was a rising star..all the wonderful things she did and saw. After spending a few moments in rememberence, I went out doors,it was a lovely sunny day (at last, the weather here in Scotland has been awful for weeks), and I planted my Anne Boleyn rose which was bought for me some weeks back, and saved to do on this day. I have placed it close to my back garden door, so it can be admired on a daily basis, this lighten the sadness of the day, and as I carried on gardening I thought about all the wonderful things she must have experienced . Tonight I have raised a couple of glasses of wine to her and the fascinating part of history that she has left us. To Queen Anne, God rest her soul! I find the end of Anne’s speech ‘And thus I take leave of world’ really heart breaking. I thought Fitzroy admired and respected Anne? That he whitnessed her exicution as a friend and not a foe. Apparently what I have read is incorrect. Not by 1536. He had accompanied Anne and his father to Calais in 1532 and Anne had helped arrange his marriage to Mary Howard, but on the afternoon that Anne was arrested Fitzroy visited his father and was told that Anne had planned to kill him and his half-sister, Mary, by poisoning them. We don’t know whether he believed it, but he appears to have sided with his father and he benefited from the falls of the men. 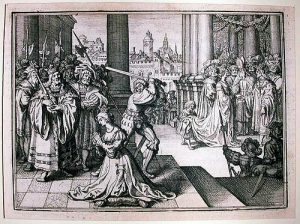 Correction to the account of Anne’s execution; she was not a queen when she died. Anne died as the Marchioness of Pembroke. Meg, it depends on how you view the annulment but at her trial, on condemnation, Anne was stripped of her crown and all her titles, except that of “Queen”. So, she wasn’t Marchioness of Pembroke any more, but she was still Queen. You are correct on that account. But I would have thought being found guilty she would have forfeited that title. Also it could be that Anne’s enemies never reconized her as queen therefore never thought it was important. Also if her annulment was based on her “pre contract to Northcumberland or her affinity to her sister, then she was never technically queen therfore she never had the title. (technicallities) But that wouldhave been the view then. The sticking point for me was that she was made Queen by statute not by marriage to the King. I will let the rest of you make your own decisions. I had read a comment which declared that at Anne’s speech on the scaffold, the references to the king (”God save the king….for a gentler nor a more merciful prince was there never….”), were ironic. According to your opinion, is it true? Because I think that by these references to the king, Anne simply wanted to express her undiminished affection to him, despite the fact that he had the responsibility of her execution. I don’t think that she was being ironic, I think she was simply doing what was expected of her and also protecting her daughter and her family. This moved me to tears. Thank you for reading it….and I am glad to have run into this site. This, and all of the comments, should be a reminder about how important it is not to forget history…as, here, we have the 1st black president in the US, and just 150 years after slavery…yet, instead of relishing in the moment…in the moment of seeing humanity perhaps move forward a bit….we just see more hatred. I am awed by Anne’s courage…amazing. I will hope to sit down with her in the next life and speak a bit. Thank you, I’m so glad that you enjoyed reading it. 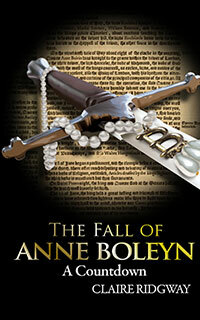 Have you checked out http://www.theanneboleynfiles.com? There are lots of articles on Anne Boleyn and Tudor history there. Anne did have amazing courage, very awe-inspiring. Thanks, Baroness, it made me cry writing it! Wonderful reproduction of this heartbreaking event. I’ve been fascinated with Anne since I was a kid, upon first reading of her hauntings of the Royal grounds and the story behind her. The depiction of the event (along with my adoration of Natalie Dormer) has often made me wonder if I could have stood there and watched her die. The Fourth Musketeer in me sees me putting a flaming arrow into the sword hand of the executioner as he begins his swing, and then pushing through the crowd to take Anne by the hand and lead her off to a new life of exile, outlaw, and adventure with me. Later I fret about what one good heavy machine gun could have done to persuade Henry and his guards to forget all about their plans that day. It’s all outlandish of course, but the wonder and mystery of Anne Boleyn inspires one to continue and even re-imagine her story all kinds of ways. Only memorable and very special people can do that. I salute your efforts to celebrate her. Circa Regna tonat, “about the throne the thunder rolls”, how very true. well said sir!-im sure I would have done something similar!-I believe the ladies that accompanied her to the scaffold were the same as ”looked after”her in the tower,but after seeing her in her pain and sorrow in the last hour or so changed their opinion of her and felt she was/is innocent!…I find it still a shame anne didn’t have any of her close friends with her though!….also I have seen a couple of accounts where anne’s body was left on the scaffold for between hours and days after-how appauling and disgraceful! !